The Stokes Kith and Kin Community Blog: Time to Buy Gold? If anything, the current recession has put money in the pockets of gold dealers. The Wall Street Journal reports a near doubling of bullion sales in 2008, and fears of a prolonged recession, coupled with inflation anxiety has had investors rushing to acquire the gleaming metal for their portfolios. This begs the question - is gold really a “wise” investment during times of recession? In a series of recent posts, R.D Norton examines the price movements of gold in times of economic downturn. Although he finds that gold prices tend to fall during recessions, the trend is not uniform. Often, prices spike amidst inflation worries as economies begin to regain health. But what about post-recessionary prices? The chart below illustrates this story from an investor’s angle: if you, as an investor were to buy $1 worth of gold in August 1971 (the date when the United States officially repudiated its obligation to redeem dollar claims on gold), how much is that dollar worth now, when adjusted for inflation? For the sake of comparison, the chart also shows the value of the same dollar when invested in an S&P 500 index fund over the same time period. (This excludes any fees that might have been charged to the investor). 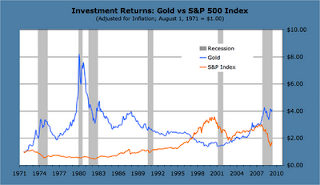 In 2009, the long-term investor who purchased a dollar of gold in 1971 would find that his investment in gold performed better when compared to the stock market (more precisely, the S&P index fund). However, consider the case of investors who gave in to the buying frenzy and invested in gold during times of recession. Buyers in the 1980’s peak still haven’t recovered their investment. Those who bought gold during the upward trend in late 1981 realized a near permanent loss on their holdings. Buyers during the 1990’s recession waited nearly 16 years to break even. While there have been some exceptions (for instance, the recession in 2001) in general, over the last four decades, buying gold during or even right after recessions has been a case of “buying high, selling low” for the average investor. In comparison, buying into market-indexed funds may seem like a less risky choice. Historically, gold has always had higher volatility of returns when compared to the S&P 500 index (a standard deviation of 5.5 percent over this time period, as opposed to 4.5 percent on the S&P). In almost all post-recessionary cases (once again, 2001 being an exception) investors managed to preserve wealth and benefit from gains as the economy regained traction. For investors who focus on the long term, gold is a wise bet as a store of wealth. However, those who are looking to time their gold purchase and capitalize on short-term gains do not fare as well. -Written by Shafayat Chowdhury of the American Institute for Economic Research.